The two very different seasonal 'faces' of Teifi Marshes Nature Reserve make this an excellent place to visit all year round. In winter the marsh is subject to extensive flooding and becomes a haven for numerous wildfowl, whilst in summer a visit to the reserve reveals an entirely different range of habitats and wildlife. 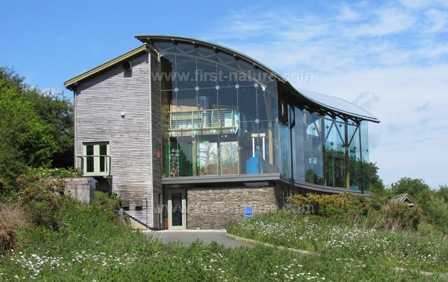 The site is owned by the Wildlife Trust of South and West Wales, and is also home to their Welsh Wildlife Centre. This magnificent building, constructed mainly of wood, won an award for its architecture when it was built in 1993. From Cardigan take the A478 road in the direction of Tenby. At Pen-y-Bryn, about 2.5km (1.5miles) south of Cardigan, take the left-hand turn towards Cilgerran and proceed along that road for about 2km (1.25 miles). On the outskirts of Cilgerran there is another left-hand turn, just after a small stone bridge, taking you down a single track-road that is signed 'Wildlife Centre and Teifi Marshes Nature Reserve'. Continue down this track for approximately 2km (1.25 miles) and then turn right into the reserve car park. For people living in the immediate area, and those who are disabled, parking is free of charge. There is a charge (£3 in 2011) for other visitors. Members of the Wildlife Trust of South and West Wales may also park free of charge. Parking for disabled people is available beside the Wildlife Centre some 250 metres beyond the main car park. There are excellent paths throughout the nature reserve, accommodating a variety of users groups. There is good access for wheelchair users, although some paths are also used by cyclists and so care should be taken when using these. On certain other paths cycling is not permitted, and they are accessible for wheelchair users - for example the circular path close to the Wildlife Centre. There is also a pedestrian access from Priory Bridge on the A487 just outside Cardigan. This bridge, which crosses the River Teifi, is easily accessed on foot from Cardigan town centre. It is not possible to park on or near the bridge. Please note: dogs are not permitted in the Wildlife Centre, and dogs must be kept on leads in all other parts of the nature reserve. The facilities at Teifi Marshes are excellent. The Wildlife Centre has a shop, public toilets, an interpretation centre, and an excellent café that serves coffee, lunches and afternoon tea. The dishes are all made from fresh, locally-sourced ingredients. The Wildlife Centre is open (times/dates last checked in 2011) seven days a week from mid-April until 30th October between the hours of 10-30am and 5pm. From the 31st October the Centre is open from Wednesday to Sunday between 10-30am and 4pm. The last opening day is Sunday December 18th. The paths throughout the reserve are a mixture of tarmac surfaces, boardwalks and woodland tracks, and it is possible to walk a really enjoyable circular route from the car park all the way around the reserve, passing all five of the bird hides. This walk also enables you to see all the varied habitats in the reserve: the extensive reed beds, ponds, woodland, and the open meadows in which various animals including Water Buffalo graze. From various vantage points along the route you get excellent views of both the River Teifi and the little tributary River Piliau. One of our recent visits to this lovely nature reserve was in late May, and although at that time it was fairly quiet on the wildfowl front there was plenty of other birdlife in evidence. Breeding birds at the reserve include Cetti's Warblers (Cettia cetti), Lesser Whitethroats (Sylvia carruca), Common Whitethroats (Sylvia communis), Reed Warblers (Acrocephalus scirpaceus) and Sedge Warblers (Acrocephalus schoenobaenus). We also saw Swans (Cygnus olor) and Moorhens (Gallinula chloropus) nesting. Kingfishers (Alcedo atthis) are never far away on the Teifi, and you may well see some from the bird hides scattered throughout the reserve. On winter evenings vast flocks of starlings (Sturnus vulgaris) come in to roost, and with them come Peregrine Falcons (Falco peregrinus) and Sparrowhawks (Accipiter nisus) hopeful of capitalising on this massive feeding opportunity. Once the marshes flood, large numbers of wildfowl arrive, notably Common Teal (Anas crecca), Mallard (Anas platyrhynchos) and Wigeon (Anas penelope). Water Rails (Rallus aquaticus), Lapwings (Vanellus vanellus), Curlews (Numenius arquata) and Common Snipe (Gallinago gallinago) are also winter visitors. 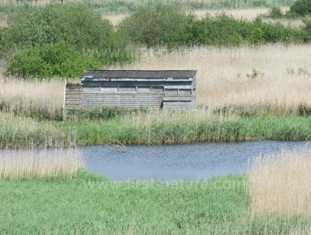 Below: One of the many bird hides at Teifi Marshes. Teifi Marshes is situated in a wide channel that was originally forged by the River Teifi. 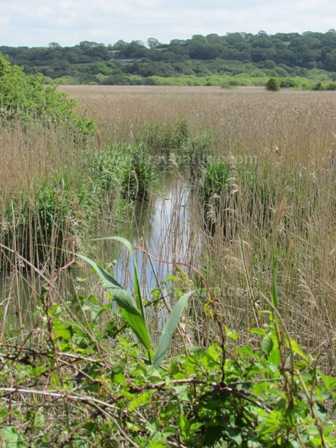 Now the Teifi runs along the edge of the nature reserve, and the very much smaller River Piliau, which rises in the Llantood area not far from Teifi Marshes, has created its own deep channel which can be seen from various vantage points on walks within the reserve. The Teifi and some of its tributaries are designated as an SAC because of their habitats and the species which live in them, some of which are threatened or endangered both in the UK context and on a European scale. Apart from its well-known stocks of Salmon (Salmo salar), Sea Trout (Salmo trutta) and Brown Trout (Salmo trutta), the Teifi is also home to other fish species including Brook Lampreys (Lampetra planeri) and River Lampreys (Lampetra fluviatilis. The gravelly nature of parts of the river bed are particularly favourable for spawning lampreys, and the smaller tributaries can provide a safe haven when the Teifi is in full spate - a relatively common occurrence in this area of fairly high rainfall. Bullheads (Gobio gobio), rarely if ever seen in most parts of Britain and mainland Europe, are also plentiful in fast-flowing sections of the River Teifi. 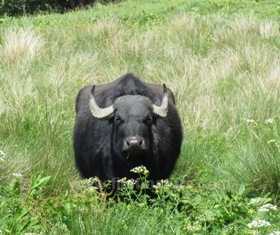 Below: Surprise, surprise - it's a Water Buffalo! Another reason for the special designation of the Teifi is the Otter (Lutra lutra) population, and there is much anecdotal evidence to suggest that Otters breed within Teifi Marshes Nature Reserve. Verification of the presence of Otters is always difficult, because they are extremely shy and keep well out of our way. Often the only evidence is their paw prints in the muddy parts of the river banks and their droppinghs (spraints) left on riverside rocks. Other mammals that you may see in this nature reserve include Mink (Mustela vison), Water Shrews (Neomys fodiens) and Badgers (Meles meles). Sika Deer (Cervus nippon) and Red Deer (Cervus elaphus) have also established a presence on the reserve. Grazing animals are used in the reserve to prevent certain areas from becoming overgrown with rank grass and other vegetation that would otherwise destroy the habitat balance. As well as sheep there is also a herd of South Asian Water Buffalo that adds an element of surprise as you walk along the path close to the single-track road that leads to the main car park. 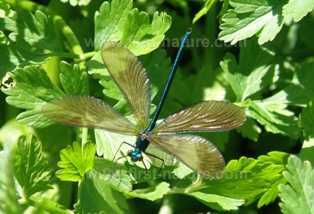 Below: Damselflies are numerous throughout the reserve in late spring and summer. There is a small area of woodland inside the reserve, but further upstream and accessible from both banks of the Teifi is another woodland nature reserve, Coedmor NNR, which stretches right up to Llechryd some 3km (2 miles) upstream. Together these woodlands support a variety of birdlife, especially during the summer when many birds visit the woods to nest and raise their young. Amongst the visitors are Redstarts (Phoenicurus phoenicurus), Pied Flycatchers (Ficedula hypoleuca) and Spotted Flycatchers (Muscicapa striata). Coedmor is also a good place to hear the Great Spotted Woodpecker (Dendrocopos major) from early spring onwards, and if you are really lucky you will also hear Cuckoos in the Teifi Valley. In quieter, shallow parts of the river Grey Herons (Ardea cinerea), that nest in the Llechryd area, wait patiently for unsuspecting small fish to swim within striking distance. If you are interested in insects, this is a great place to see damselflies, dragonflies and butterflies. The dragonflies seen here include the Broad-bodied Chaser (Libellula depressa), Emperor (Anax imperator) and Southern Hawker. The Blue-tailed Damselfly is also present at Teifi Marshes and, on a recent visit in summer, we also saw lots of Banded Demoiselles (Calopteryx splendens). Numerous frogs and toads make their homes at Teifi Marshes, and reptiles are well represented too, with both Grass Snakes (Natrix natrix) and Adders (Vipera berus) frequently spotted by those people who move quietly and slowly through the reserve. In early spring the woodlands in this part of Wales are full of Bluebells, and at Teifi Marshes there is also the added pleasure of seeing vast stands of Yellow Flag Iris (Iris pseudacorus). 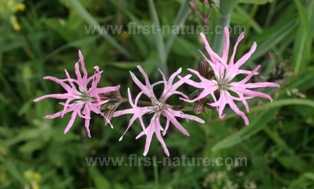 Other lovely plants in the reserve include Ragged Robin (Lychnis flos-cuculi), Meadowsweet (Filipendula ulmaria), Red Campion (Silene dioica), Bulrushes (Typha latifolia) and Woody Nightshade, also known as Bittersweet (Solanum dulcamara). The whole of the Teifi Valley is bursting with wildlife set against a backdrop of beautiful scenery; and scattered along the valley there are some wonderful nature reserves that make it easy for us to get right into the heart of the habitats where some of these amazing creatures live.